...and it disappears from public view until roughly 1992 when it's again photographed for another Japanese phtoshoot. The pick-up ring was originally creme, but Ed colored it black with a marker! ...notice two things: the shape of the control cavity-it's actually an inversed Strat control cavity! Also,there's the fact that there's a second pot. What was the purpose of this second pot? Most likely, it functioned as tone control. How many times have you read or heard that Ed hated this guitar? Probably enough times to believe that it was true, but I submit to you that this was not the case. Sure, he may have had some issues with the sound/tone due to the Floyd, but I believe he actually loved this guitar. Afterall, WHY would he play it live for three consecutive world tours?! 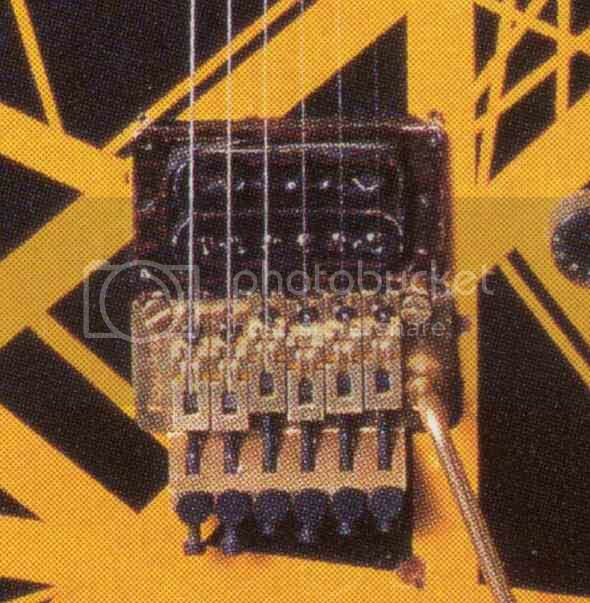 The notion that Ed disliked or even hated the Charvel VH II is not accurrate. 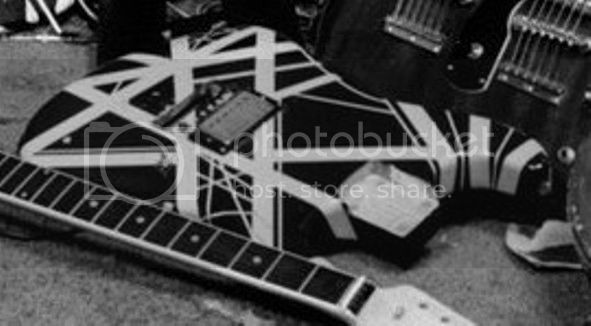 What Ed really hated was the fact that Grover Jackson was building and selling EVH-style striped Charvels without his permission! That's why he denigrated the guitar! Ed was furious at Grover and any potential endorsement deal with Charvel that might have been on the table at the time ended when Ed had his lawyers issue a "cease and desist" order. 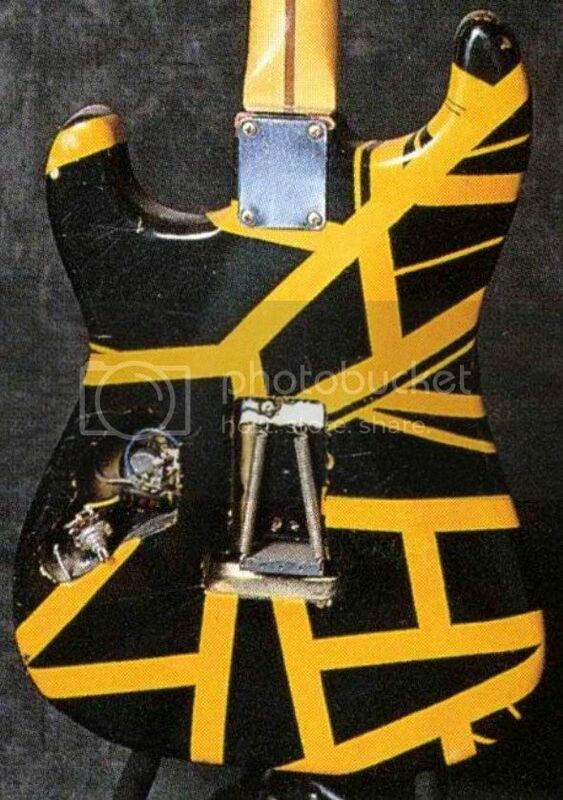 Dime had asked Ed for a black and yellow EVH Art Series Charvel. Ed was going to give him one, but before he could, the insane, senseless tragedy happened. 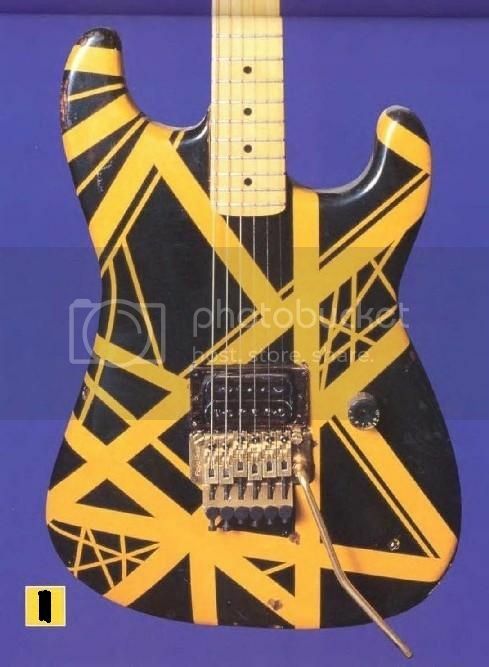 A grief-stricken Ed then did a truly selfless and noble thing- he gave up the original black and yellow Charvel so that it could be buried with Dime. Last edited by jimi11580; 04.04.11 at 07:57 PM. These are GREAT! THANK YOU for doing this. Great choice of pictures, nice "matter-of-fact" details, cool thoughts on theories, and overall, its just a fun read. Good job! Aces! Thanks, Josh. You know this is all your fault, right? LOL! Awesome Thread!! Love the VH2 axe. 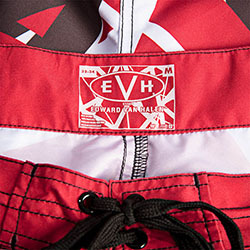 I will say Ed giving up the real VH II for Dimebag's casket was one of the coolest things he's ever done. I give it up to him for that. Seeing these pics makes me want to build one. I know I've seen one.... if I'm remembering right it was in a montage without sound.... I'll see if I can find it. There was a video floating around on Youtube from the 1980 Pink Pop Festival in Holland. It shows Eddie playing "Running with the Devil" with the VH II, but it's a mere seconds worth of footage. I'm sure that there is plenty of footage out there from the the three world tours that Ed used that guitar. Whether it will ever be released or seen again publicly is another story, though. I saw someone posted that in Nov. or Dec. It was just a couple seconds. Very cool thread Jimi. Did Ed use the guitar on any album tunes that you know of? I can't recall. Forgive me if you already answered. I have not gone over all the posts since yesterday. Just on a quick break at work. Did Ed use the guitar on any album tunes that you know of? I can't recall. Last edited by tommywho5150; 04.05.11 at 11:12 AM. Now, Jimi, far from me to question your knowledge, but I thought that the VH-II was only made available after the recording of the album. If I remember, the story goes as Ed had just received it for the photo shots of the album. I think that we can say for sure that he didn't use the Shark, though, since, at the time, it had already been sawed from Destroyer into Shark, and, according to misleading Ed, the tone changed... for worst! Last edited by jimi11580; 04.05.11 at 11:33 PM.